On a cold, wintery day what better way could there be to spend your time than visiting and appreciating the beauty of an art gallery? I had the opportunity to visit the Corning Museum of Glass in Corning, New York in January to take in their massive collection of glassworks. 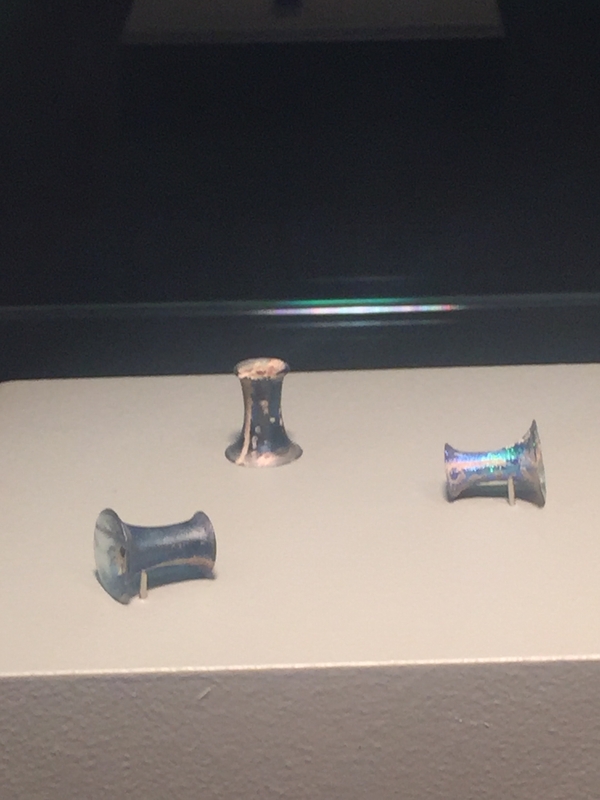 The museum houses nearly 50,000 objects spanning over 3500 years, and is considered an authority on glass art displaying items from as far back as ancient Egypt to contemporary sculpture. 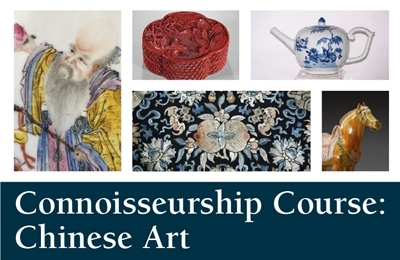 It was a true pleasure to spend time studying a variety of pieces, especially those of early Chinese glass. 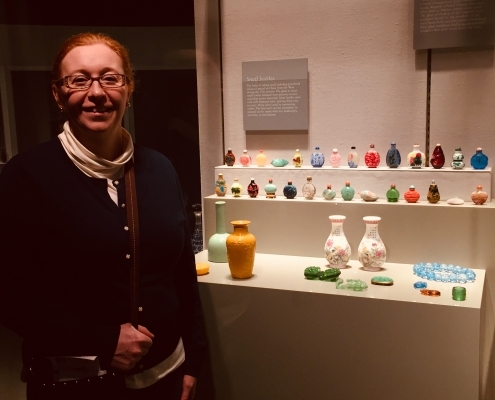 Here I stand with an impressive snuff bottle collection on display at the museum. It really is quite amazing to see a place dedicated to sharing 35 centuries of glass-making! Definitely worth the drive to Corning, New York. Another highlight of my trip was discovering unique works of art from the Qing Dynasty, (the last imperial dynasty of China 1644-1912.) 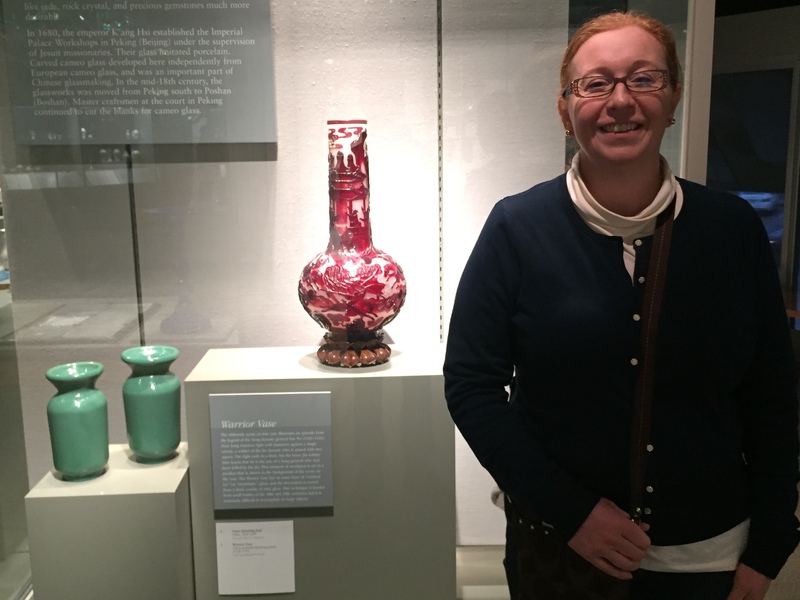 Here I am with the “Warrior Vase,” an unusually large example of cameo glass, from the Qianlong period (1736-1795). The collection has contains many special items. Below is a set of early glass objects from the Han Dynasty (206BC-220 AD). Earlier this week I posed the question on Facebook, what are these? And what were they used for? A potentially dangerous question to put out on the Internet for sure (lol), but for those who are curious these are Ehr Tang (Ear Ornaments). Their purpose was to be inserted into the ears of deceased people to prevent the escape of vital essences from the body. Rather different, but fascinating at the same time, to see the beauty and detail included in such an extraordinary object. Taking a stroll through Corning Museum of Glass was a wonderful way to spend an afternoon. 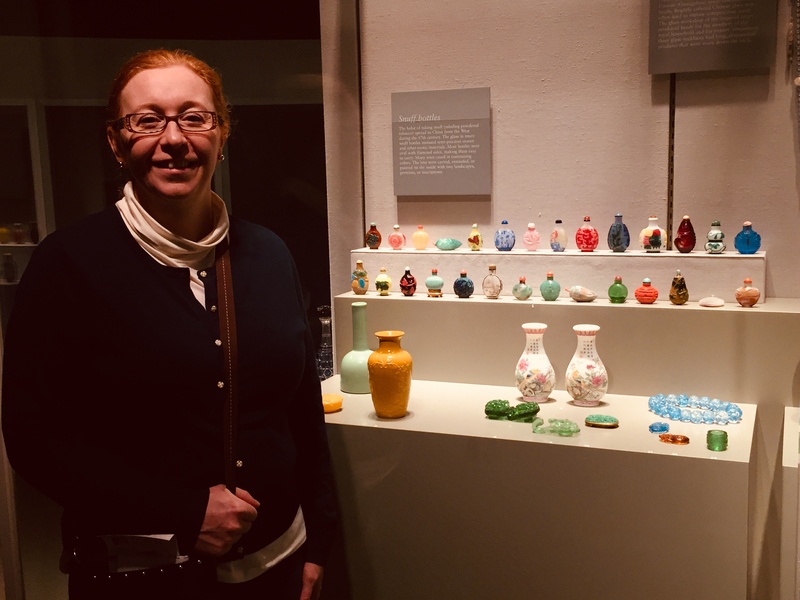 On your travels, if you find yourself in the Corning area of New York state, I would urge you to take the time to stop and visit this spectacular collection of glass from around the world. Also keep an eye out for my next post about my next visit to the Art Gallery of Burlington. 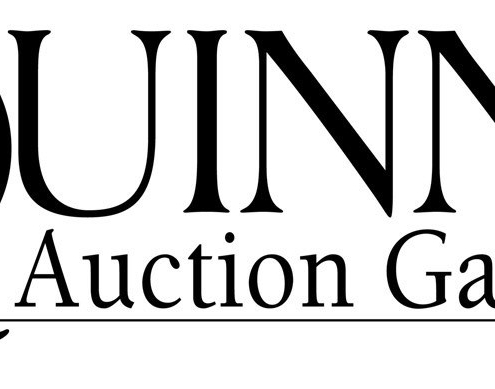 We look forward to seeing you at this year’s FAE Educational Seminar held at Quinn’s Auction Galleries. in Falls Church, Virginia on September 7-8, 2018. Appraisers, scholars, students, and collectors will enjoy a diverse group of presentations* by experts and professionals. Schedule is subject to change and may include additional speakers. This list is in alpha order. Don’t forget that you can earn 12 International Society of Appraisers Professional Development Credits for full participation in the seminar. The registration fee for the Seminar is $395 for the full two days. If only attending one day, the fee is $200. Payment can be made following the PayPal link on the FAE website. Click here to be directly sent to Seminar Registration. See the ISA website for registration for Advanced Appraisal Methodology and 7 Hour Personal Property USPAP.